A new cli-fi novel explores a near-future nation using an enormous wall to combat sea-level rise. The British novelist and journalist John Lanchester has long explored large, systemic problems in his fiction. His 2012 novel Capital, for instance, examines the onset of the 2008 financial crisis. His latest, The Wall, takes on climate change. It’s set in the near future, in a nation surrounded entirely by water. The government has built an enormous wall to keep out the rising seas as well as the “Others,” desperate people from less privileged nations seeking escape from the catastrophes of climate change. This is a world fighting over basic resources, and the generation just out of high school gets drafted to defend the wall, their “tours” lasting two years each. The protagonist is Joseph Kavanagh, a recent graduate who isn’t sure what he wants to be when he grows up but who’s fascinated by the lives of the “elites” – the world’s most privileged who escape the draft. When we meet him, Kavanagh has just begun his tour. The long, cold nights he spends on the wall throw his loyalty to his country into question, and he begins to wonder about the morality of keeping out the Others. 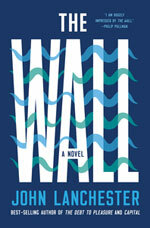 The Wall is a harrowing but beautifully written novel that speaks not only to the uncertainties of life in the Anthropocene but also to recent discourses surrounding racial and economic divisions, nationalism, and immigration. Lanchester and I spoke about what inspired the novel, the links between climate change and conflict, and his hopes for the future. Amy Brady: The Wall depicts the aftermath of a world ravaged by catastrophic climate change. Was there a particular report or point of public discussion that inspired the story? John Lanchester: The book actually came to me in a dream. I dreamed of a wall in the cold holding back water. But since having that dream I’ve been trying to keep up on discussions surrounding climate change, reading about it and following it as best I can. It’s been hard to think about it or engage with it because it’s so unwieldy and grim. Amy Brady: And yet your book seems so realistic. John Lanchester: There is one aspect of climate change in particular that I’ve followed closely – something called climate departure. It’s based on scientific studies with literally billions of different data points. The data shows that climate change has brought about a whole new range of temperatures around the globe. Climate departure occurs when current averages begin to exceed previous ones. I was quite struck by this. Amy Brady: I read a lot of novels that deal directly with climate change, but yours is one of the few to address the relationship between climate and conflict so explicitly. John Lanchester: I think that scientists and other experts are cautious about drawing too explicit a line between climate change and conflict. But conflict is implicit in the data. If sea levels rise, and coastlines get drowned, and crops fail, then we could see conflicts over resources on a scale that the world has never seen. One of the scarier scenarios is that tens of millions of desperate people will need to flee their homes. Amy Brady: The title of your novel is rather provocative given Donald Trump’s discourse on immigration. Did Trump’s talk of building a border wall inspire any part of this book? John Lanchester: Well, not directly, but the American 2016 election was going on when I was writing this book. And so was Brexit. This is a time of increased division and barriers, and walls of all kinds have come to represent that. Amy Brady: Despite your novel’s themes of division and conflict, it contains an air of hope. Are you hopeful for the future? Or do you think we’re all doomed? John Lanchester: I think hope is important. Climate change is so big, that without hope, we feel we have no agency, that there’s nothing to be done. And that’s an invitation to despair, and that, in turn, is an invitation to inaction. We can’t afford despair. I feel there’s almost a moral and political obligation to be hopeful. That’s the only way we will act collectively to keep the world at 1.5 degrees Celsius of warming. Two degrees is often used as the cutoff, but that half a degree means hundreds of millions of people are prevented from experiencing catastrophically negative impacts. Amy Brady: We so often think of climate change as this dualistic proposition – that we will either stop it or not. But perhaps we should be thinking about it in terms of where we will stop it: at 2 degrees, or 3, or more. John Lanchester: Yes, something I think about a lot is the kind of world we will leave behind us. How do we want to seem to our descendants? What kind of verdict do we fear? That’s one of the ways to urge ourselves to action – to think about how our decisions will look in retrospect. Amy Brady: You touch on that in your novel. Kavanagh’s relationship with his parents is heartbreaking, because they walk around feeling guilty all the time. John Lanchester: Yes, and he’s really angry. If the scariest predictions of climate change happen within a generation or two, then we’ll have generations of people living in what’s effectively a different world. And it’s hard to imagine that happening without a degree of blame. Kavanagh certainly carries that blame, and I think it’s possible to wonder whether it’s fair for him to do so. Family arguments so often are about what’s true but not necessarily fair. Amy Brady: I want to talk about the structure of your book, because it’s unlike your previous work. It’s almost circular in nature. Did that come to you fully formed? John Lanchester: More fully formed than usual. I almost always have a sense of where the story is going when I’m writing. If I didn’t it would feel like building a bridge without knowing where the other side would connect. But in this case, the structure was related to the dream. The ending in particular came to me early on. Amy Brady: Your book just hit shelves. What’s next for you? John Lanchester: I was part way through another novel when I started The Wall, so finishing that earlier book is on my immediate to-do list. I hope to find that it’s still alive. Frankly, I’m not sure I will. If it’s not, I have a book of stories I’m working on. That’s plan B. But I probably won’t focus too much on either of those projects while I’m on tour. If I did, I’d end up thinking about the writing I want to do instead of the book tour, and that’s not really fair to the book that just came out. And this book in particular has shifted something internally for me. Climate change was always hard for me to think about, and now I feel I must think about it. I hope the book has that effect on others as well. John Lanchester is the author of the novels The Debt to Pleasure, Mr. Phillips, Fragrant Harbor, Capital, and The Wall, as well as several works of nonfiction. He is a contributing editor at the London Review of Books and his work has appeared in The New York Times, The New Yorker, The Observer, and The Daily Telegraph, among others. Among several other prizes, including the Whitbread and Hawthornden Awards, Lanchester was awarded the 2008 E.M. Forster Award by the American Academy of Arts and Letters. He lives in London. Reprinted with permission of Amy Brady and Chicago Review of Books, a Yale Climate Connections content-sharing partner.